Shares in Debenhams surged by a third in value this morning after the embattled UK retail chain secured £40m in extra funding from some of its lenders, giving it more time to secure its longer-term future. Once Britain's biggest department store chain, Debenhams has been struggling with net debts of almost £300m. It plans to close 50 underperforming stores, putting about 4,000 jobs at risk, after it failed to keep pace with consumers moving online and to cheaper outlets. It said the new loan, agreed for a period of 12 months, would act as a bridge to "facilitate a broader refinancing and recapitalisation". The company also said it was still talking to its stakeholders and would conclude a "comprehensive refinancing". The retailer, which is striving to avoid the fate of collapsed rivals BHS and House of Fraser, also said it had signed an agreement with Hong Kong-listed supply chain solutions firm Li & Fung to develop a strategic sourcing partnership. Shares in Debenhams, which lost more than 85% of their value in 2018, were up 33.9% this morning. That lifted the company's market value to £52m, although some analysts questioned whether the extra funding would be enough or whether Debenhams might yet take up an offer of financing help from Mike Ashley's Sports Direct, its biggest shareholder. 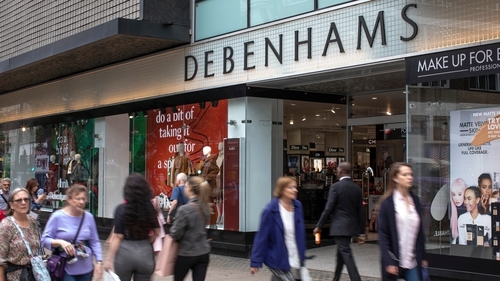 "This interim solution shows the ongoing discussions with their lenders are constructive and ensures Debenhams can get through its working capital peak in April," analysts at Investec said in a note. "The strategic announcement with Li & Fung also enables them to consolidate its supplier base more quickly and helps those suppliers which have a credit insurance issue," Investec added. UK media have reported previously that Debenhams had turned down an offer of a similar cash injection from Ashley's Sports Direct, which already holds almost 30$ of the company and has snapped up businesses after a number of UK high street collapses. Before today's plan was announced, Debenham's combined credit score - which measures how likely a company is to default in the next year on a scale of 100 (very unlikely) to 1 (highly likely) - was "1", Refinitiv Eikon data showed.